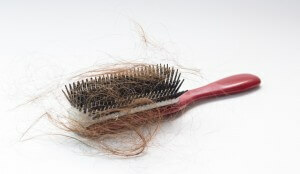 Suffering from hair loss can be a very disheartening experience for anybody. And because hair loss can be caused by a number of possible conditions, figuring out the source can be a challenge. For those dealing with unexplained hair loss, however, it may be worth questioning whether a thyroid condition could be to blame. First of all, it’s important to realize that hair loss can be normal. As the body ages, its ability to regrow hair can diminish. However, when hair loss comes on suddenly or at an especially young age, it’s important to determine the cause and appropriate treatments. In normal conditions, the majority of your hair follicles are in “growing” mode, whereas some are in “resting” mode. However, when you have a thyroid condition (such as hypo- or hyper-thyroidism), it’s common for the resting follicles to outnumber the growing ones. This is what leads to hair loss. Usually, when a thyroid issue is causing hair loss, it will occur in the form of gradually thinning hair all over the scalp. Therefore, if you’ve been experiencing bald spots or concentrated areas where hair is falling out, it’s less likely that a thyroid condition is the cause. Unfortunately, there’s no universal treatment for hair loss caused by a thyroid condition. However, it’s always important to begin by treating the source of the problem before focusing on hair restoration. Once the thyroid problem is under control, different treatment options can be attempted to stop hair loss and even encourage regrowth. It’s important to note that hair lost as a result of a thyroid condition can grow back just as full and healthy as before. Therefore, those suffering from hair loss because of a thyroid issue should not get discouraged or assume they’re destined to a life of thinning hair. If you’ve been experiencing hair loss and you’re not sure why, it’s never a bad idea to have your thyroid levels tested—even if you don’t experience any other symptoms of hypo- or hyper-thyroidism. Once you’ve managed the cause of your hair loss, it’s time to focus on hair restoration. With locations in Yonkers and Manhattan, Metro Vein and Aesthetic Center can help. Simply give them a call at 914-295-2202 or send an e-mail to nymetrovein@gmail.com to set up your appointment or learn more.